Stefano bought his first bike at the age of 16, riding around the Manx-like streets of Lago d’Iseo in the north of Italy. His parents were not keen on him racing, however as soon as he turned 18 and could race without his parent’s approval – he was competing in the Italian CIV Championship. Bonetti started his racing career in the hill-climbing championships in Italy which he excelled at, winning a number of Italian Championships. In 2004, Stefano made his way to the Isle of Man, leaving Italy in a Fiat Ducato van with only friends, bikes and mattresses. His debut TT season saw him race in the Junior 600cc, Production 600 and Senior races. His highest place finish came in the Production race riding a 598cc Suzuki, finishing in 22nd to win his first silver replica and finishing just one place behind fellow debutante Guy Martin. As well as this, he finished 28th and 40th in the Junior 600cc and Senior races respectively. His highest average race speed in his debut season was 112.37mph in the Production 600 race. Since his debut TT season Stefano has returned to the Isle of Man every year other than 2006 and 2013, both due to injuries, the latter of which came after suffering serious injuries at the 2012 Macau Grand Prix. His second appearance in 2005 saw Bonetti achieve a fine 14th in the Superstock TT, achieving an average race speed of 116.551mph. This was the same year he placed 27th in the Supersport Junior B and 58th in the Junior A race. 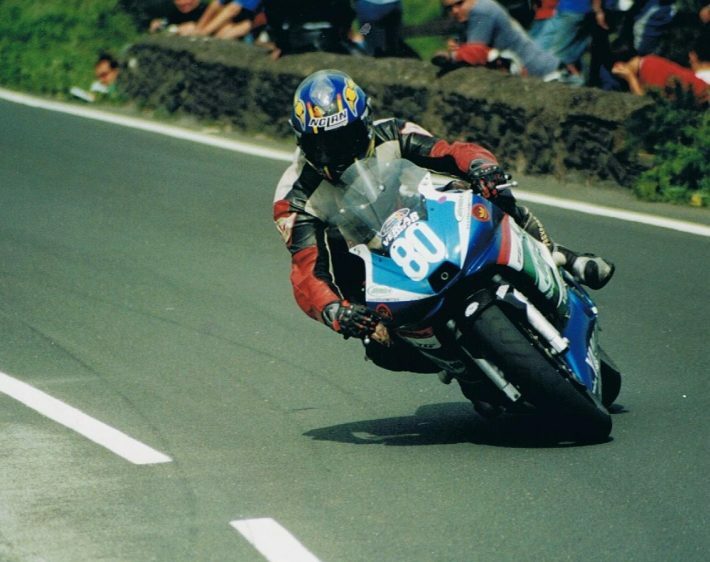 Returning from injury in 2007, Stefano achieved 21st in the Senior TT riding a Suzuki GSXR 1000cc, achieving his first 120mph+ lap in a race won by John McGuinness. He emulated this result in the Senior TT the following year placing 21st for the second year in a row. Bonetti’s highest TT finish came in the 2016 Lightweight TT placing 5th, riding a Italian Paton S1. This feat saw Stefano’s average race speed at 115.334mph, leaving him within 7 seconds of the Lightweight podium, in a race that was won by Ivan Lintin. He was running in a podium position in 2018 before being forced to retire at half race distance. His highest Senior TT finish came in both 2011 and 2016, where he placed 17th. The 2016 was his fastest TT race to date, with an average race speed of 122.685mph. One of the most consistent performers around the Mountain Course, he has become known as the fastest non British rider at the TT in recent years – with a record like that it’s clear to see why! Stefano has not only impressed at the TT, finishing 5th in the 2012 Superstock race at the North West 200 is up there with his top road racing achievements. There’s no doubt about it, Stefano’s highlight of 2018 came in the Lightweight TT race, where he achieved his best TT finish to date, placing 4th behind Michael Rutter. Riding the Paton S1 at an average speed of 118.106mph, it took Bonetti 01:16:40.194 to complete the race whilst he also became one of only seven riders to lap at more than 120mph in the Lightweight class. A valiant effort in the Senior race saw Stefano place an impressive 17th riding a BMW S1000RR, in the thrilling won by Peter Hickman, Bonetti beat 18th place Raul Torras Martinez by just over 13 seconds and it was in this race that he set his best ever lap to date of the Mountain Course with a speed of 127.070mph. 19th in the Superbike and 24th in the Superstock race added two more bronze replicas to his collection and capped a solid effort from Bonetti in the 2018 Isle of Man TT, with the future looking bright for the Italian. Because of its likeness to the roads of his home town Lago d’Iseo, we believe the Isle of Man TT course is definitely up there with Stefano’s favourite course.